Craving apple cider, apple pie or caramel apples? Peddler's Village throws an annual festival celebrating apples each fall. Crisp. Sweet. Refreshing. Apples are a true symbol of fall. It's hard not to crave apple cider, apple pie and caramel apples once the temperature drops to sweater weather. To celebrate apple season in Bucks County, Peddler's Village is throwing a two-day festival, beginning Saturday, Nov. 4. Attendees to the outdoor, family-friendly event can enjoy fresh apples from local Bechdolt’s Orchard or indulge in apple baked goods. Reserve an apple pie ahead of time here. There will be a large variety of apple treats to taste, but if apple pie is your favorite, then sign up for the pie eating contest. It will be held at 3 p.m. on both Saturday and Sunday. The festival will also include an artisans market – where jewelry, pottery, clothing, woodworks, leather, glass and more will be sold – and some of the artists will demonstrate their craft-making process. There will be live music and activities for kids, too. 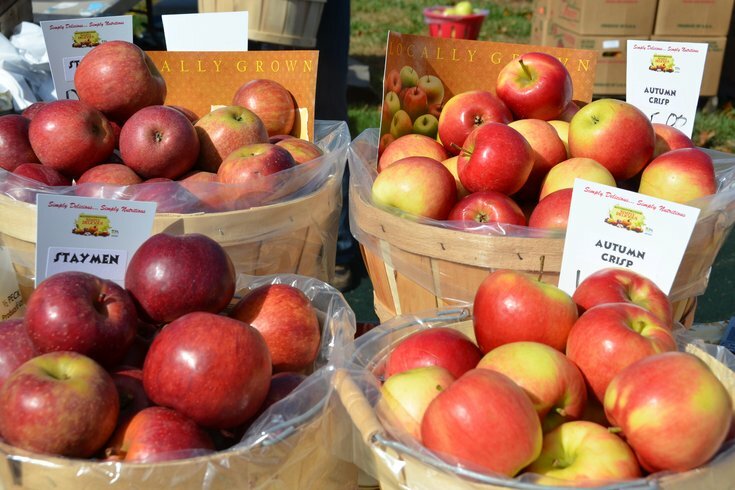 The Peddler's Village Apple Festival is free to attend and will take place rain or shine.